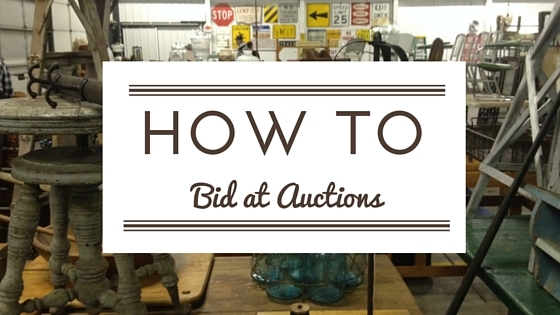 Have you always wanted to attend an auction, but weren’t really sure what to do or how it works? These nine helpful auction tips will have you bidding like a pro in no time. But remember, experience is your best friend, so be sure to take your time getting to know the process! Arrive early. It’s important to inspect the items offered for auction. Many auction houses will have a previewing time before it starts. For example, buyers can preview items for the weekly Shipshewana Miscellaneous & Antique Auction every Tuesday until 5:00 PM and Wednesdays starting at 5:30 AM. Or, you can look at a sampling of items online at auctionzip.com. Be prepared to buy. Drive your truck, and take boxes and blankets for packing. In other words, don’t ride a bike to an auction! You never know when you’ll find a great piece of furniture. Be sure you have a buyer’s number. Most likely you will need to register with the auction company and get a buyer or bid number. Most will ask for a photo I.D. Understand the terms of the auction. These are usually announced by the auctioneer prior to auction time. (also known as opening statements). Most of the time you can also find the terms listed on the sale bill or auction advertising. Bid with confidence. When you bid, nod your head, wave your hand, lift your buyer number, or do whatever it takes to get the auctioneer’s attention. Before bidding for the first time, just stand back, watch and observe until you get a good feel for what’s taking place. Know what you’re buying. Generally speaking, everything is sold “as is, where is.” In other words, you buy what you see. If you think something is old, but turns out to be brand new and you were the highest bidder, guess what, it’s yours! (see tip number one). Listen to the auctioneer. What he or she says, stands. Many items of similar value are sold “choice out” or “choice off the table.” This means that if you are the highest bidder, you can pick out as many items off the table for your bid. So, if the bid was $5.00, and you took four items, you just spent $20.00. In other instances, items are sold “by the piece times the count.” Sets of like items, such as chairs or dishes, are often sold this way. By the piece times the counts means that if you are the highest bidder, and the last bid was $100.00 on a set of six items, you just spent $600.00. Know your rights. As a buyer, you do have some protection. You have a right to reject an item if it was misrepresented – but you must do so right away. For example, if a nice vase is being offered, and is said to be in “perfect shape,” you may turn it down if it is handed to you and there is a hairline crack through it. But let’s say this vase was held up in the air to be sold, and no statements are made about it. Guess what? If you’re the highest bidder, it’s yours. That is why you go early to inspect the goods and know what you’re bidding on. Have fun! Sometimes things sell for way too much while other times things sell for way too little. That is what makes an auction fun and worth the time. Auctions are a good resource to find unique and great items, so enjoy the thrill of the hunt! Now that you've read these tips, why not plan to attend a Wednesday Shipshewana Antique & Miscellaneous Auction? The bidding starts at 9:00 am. Make it an overnight trip by staying right across the street at the Farmstead Inn.